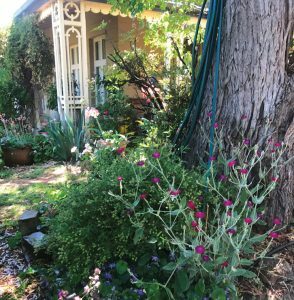 ‘Waverley’ was built in 1864 by Mr George Smythe, a Melbourne based barrister, who moved to Castlemaine to be closer to his recently married daughter. George was soon elected to represent the district in the Parliament of Victoria in the early 1860’s and once this position was completed, he became the Coroner for the Region — with a reputation as ‘The Compassionate One’ following a very sad case. Other families to have lived here were the Freemans, (several generations) who were well respected and one of whom held the position of Mayor of Mt Alexander Shire in the early twentieth century, as well as Don and Edna Blakely, both from pioneering families of the district. 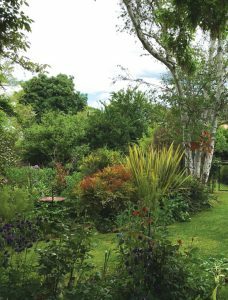 Sally and Rob Leversha have occupied the property, since 1987 and so there have been a number of residents who have contributed to the planting and layout of the garden, which now surrounds the property. The garden itself is of two parts — the front garden faces West — this features an original granite block front wall, and an elevated garden behind. A magnificent very old 25 metre high callistemon dominates the driveway side of the garden. Roses, agapanthus and irises are seen in the garden beds, with a pathway of hardy mini-cog acacias as well as a variety of other shrubs throughout. These are all wonderful examples of what grows well and what are capable of surviving the extremes of heat and frost. The rear garden faces East: the feature of the garden is the original two storey stables, and the large European trees, which give height, structure and important shade in summer. There are water features scattered throughout, attracting amazing local bees and bird life. A rough crazy slate sitting area is located under a large pergola supporting very old grapevines and with the stables behind, this Tuscan like area is the perfect place to sit and view the garden. There are several garden beds with a mixture of Australian, exotic and classical English plants, dominated by the deciduous trees. We hope you enjoy your visit to this shady suburban garden.